This week in NYC there was an incident on the subway - and by incident, I mean TOTAL UTTER CHAOS. This little article spells out the details. I am one of the few people who love riding the subway. I find it meditative to hang on to a pole or lean against the doors or, wonder of wonders, find a seat! I close my eyes and kind of sink into the soup of all the other people trying to get to their very important places. It’s a beautiful way to surrender. I’m forced to depend on someone else to get me where I need to go, I have no choice but to be near others, and I never know what to expect on any given day, on any given ride. For those of you not in NYC, here's a little mass transit primer: rush hour + holidays = grumpy, tired, over worked, stressed, squished, puffy coat wearing, shopping bag carrying people who are embodying everything BUT holiday spirit. It ain’t pretty. On top of all that, there is a population of riders who find their spot on the train and they become immobile. They will not shift or budge or scoot to make room for their neighbor. They appear proud of their subway real estate and aren’t about to give it up. They crowd around the door and make it impossible for anyone to slip into the far reaching empty corners of the subway car. And they glower at you if you ask them to please step in to make room for you. It’s exasperating! The day after the day of TOTAL UTTER CHAOS, I was one of those people riding the subway trying to get to their very important place. I experienced a single act of generosity that just rocked me. On top of the rush hour + holidays equation, there was a residue from the day before, a tension in the subway stations so different than other days. (If you didn’t read the article above, DO, because it is fascinating that things like this happen and seem to arrest the momentum of functioning cities.) The subway platforms were so crowded that people were in danger of spilling into the tracks because the throngs of people were so forceful. That is scary stuff right there! I stepped one foot into a subway car. It was sardine-packed-full, but there was plenty of room in the far reaching corners for other passengers to shift and make room for probably three other people. I asked a woman to shift so I could get on, and she gave me the good ol’ glower. Before I could even decide between asking her again or stepping off the train to wait for another, I felt a push towards me. I thought, ‘oh great, now someone is actually pushing me off the train!’ But instead of being pushed off, I was pulled ONTO the train. A man, two people deep into the subway car, dove his arms in between two passengers, parted the sea of people, encircled those arms around me, and hugged me onto the train! The little bell dings, the doors close, I am safely inside the sardine car. It was a tiny baby Christmas miracle! That man’s actions touched me. Literally and figuratively. Open your arms. In a world (and situation) where most people look the other way, so as not to be touched or have to breathe the same air as their neighbor, this stranger gave up some of his personal space to make room for another. For me! In the life of a New Yorker, this was huge. People just don’t do that. That man inspired me to start looking for the wiggle room in situations. Where can I open up my arms to make room for someone else? My train hugger, he believes what I believe; there is enough room for everyone, there is enough of everything for everybody if we share. The generous people at Stoneridge Orchards shared their dried fruit products with me this year and I developed some recipes for them. I came up with Cherry Almond Power Bites featuring their Montmorency cherries. They are perfect for the holidays to prepare for a cookie swap, to bring to an office party, or for your own celebrations! 1. 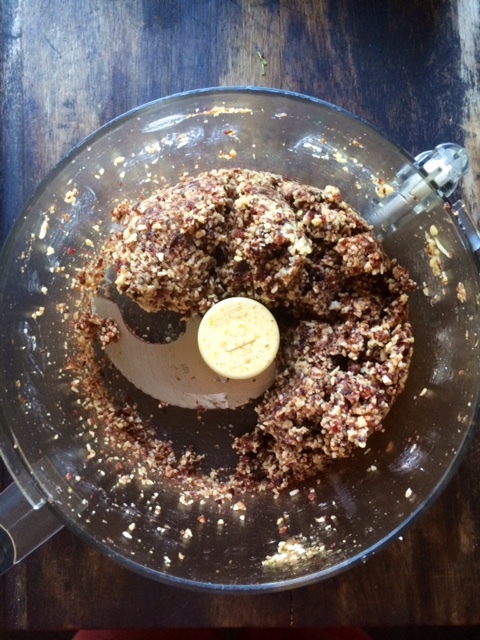 Place almonds, flax meal, cherries, cranberries, hemp seeds, honey and salt in food processor. 2. Pulse until ground and then pulse in water until the mixture begins to form a solid ball. 3. Press mixture firmly into an 8 x 8 inch baking dish -lined with wax paper. 4. Slice into bars and serve. 5. Makes 15 small bars. My dear friend Cheryl Stockton of Stockshot Photography, makes room in her busy schedule to take pictures of my food. How lucky for me!